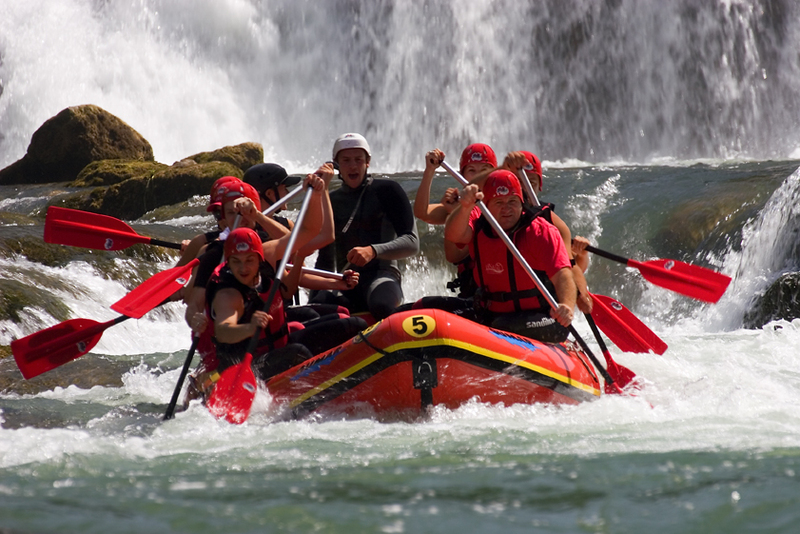 Guide to the white water rafting and canoeing in Croatia - Explore Croatia Become a Patron! 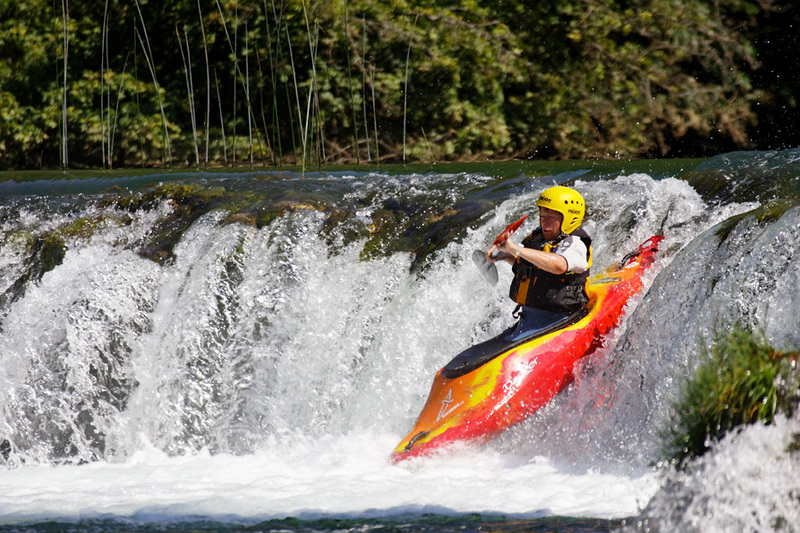 Croatia is the land of the rivers, so the rafting and canoeing on the white waters are very popular. 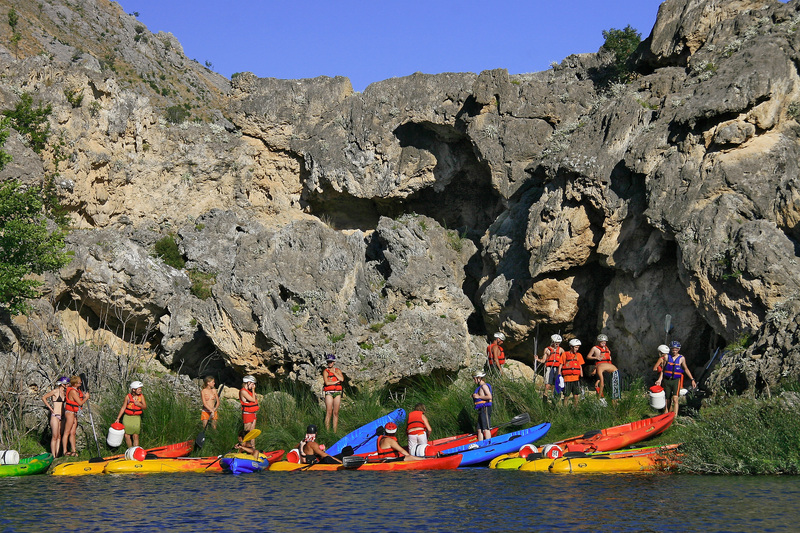 The Cetina River, the Zrmanja, the Kupa and others among the rivers that offer lots of fun and adventure. Jump to the inflatable boat and take a tour to whitewater rafting and canoeing. Rivers of Croatia are undoubtedly one of the most important natural assets. Even world-famous Plitvice Lakes are in general a river with natural barriers with waterfalls. No European country as Croatia has such diverse, yet preserved rivers. Maybe no other European country has such diverse, yet so preserved rivers as Croatia. Adriatic coast is world-known, with crystal clear sea, rocky coastline with ancient stone towns like Dubrovnik…The sea is however not the only richness of Croatia. Its rivers are undoubtedly one of the most important values. From murky and slow lowland rivers that flood huge floodplains; through short and fast mountainous rivers that flush on rapids; then rivers in Karlovac region with travertine (tufa) waterfalls and slow, almost marshy parts with lush vegetation; quiet streams in karst polje that are lost in the dark underground only to spring at other place; until big Adriatic rivers in deep barren canyons with waterfalls, that meet the sea in narrow estuaries like Zrmanja or wide delta-like Neretva. Since they are diverse and untouched, they are oases of life containing preserved biotopes with rare and endangered species on the European level. Because of their particularity, many endemic species live in them; among fish species in karst rivers around 15 are endemic. For true whitewater rafting and canoeing, only karst and mountain rivers are truly interesting. Read more about Croatian Rivers. However, there are no alpine rivers with big rapids. Instead, natural tufa (porous, fast-growing rock) barriers create waterfalls that are suitable for rafting. 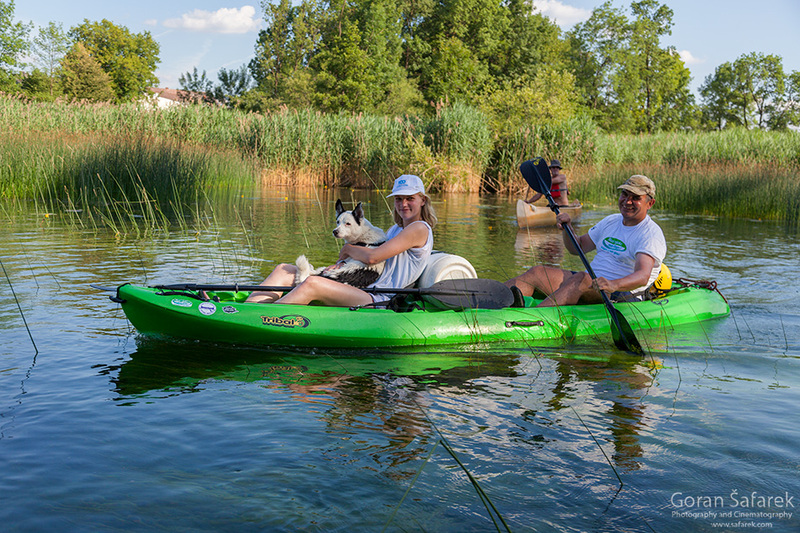 The tufa is soft rock and susceptible to erosion, so some of the rivers in protected areas are no go for rafting and canoeing (Krka, Plitvice Lakes, Krupa…). Croatia is a small country, and the rivers are of the historical boundaries, so they are shared by two countries. The Kupa and the Una rivers are borders to Slovenia and Bosnia and Herzegovina. Before setting off on the unforgettable river adventure, you will meet your river guide who will give you basic instructions and information and provide you with the necessary equipment (helmet, life vest, and paddle). After having been informed about the rules of behavior during rafting, you will get aboard the rafts and go through the basic paddling techniques on a calm part of the river. Now you’re ready and set for your river adventure! Most of the rivers are seasonal. In the spring, rafting is possible, but in the summer, when the water becomes scarce, canoeing takes over. Most of the agencies are operating from the spring to the autumn, during the tourist season. 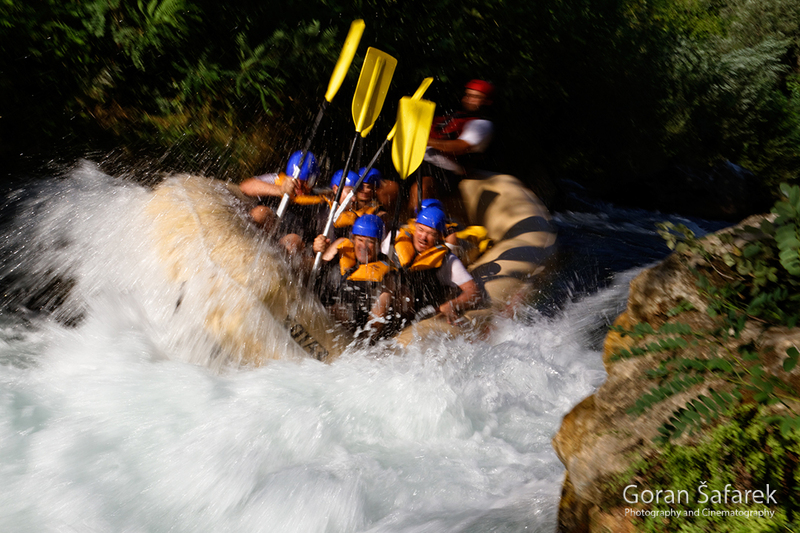 Most Croatian rivers have a difficulty grade 3, so it is not the extreme, but still enough to offer good fun. Beside Una, most of this rafting and canoeing are suitable for families. The added values are lovely, wild landscapes, especially on karst rivers. The Kupa River springs in Risnjak National park (Gorski kotar region), and shortly flowing in this protected areas. When it reaches the Čabranka River, it turns to the east and becomes a border with Slovenia, in a broad and very picturesque valley until Karlovac where it becomes lowland, meandering river. Here, near Osilnica is the best rafting. Most of the Kupa is graded as for difficulty II, with elements of Grade III. 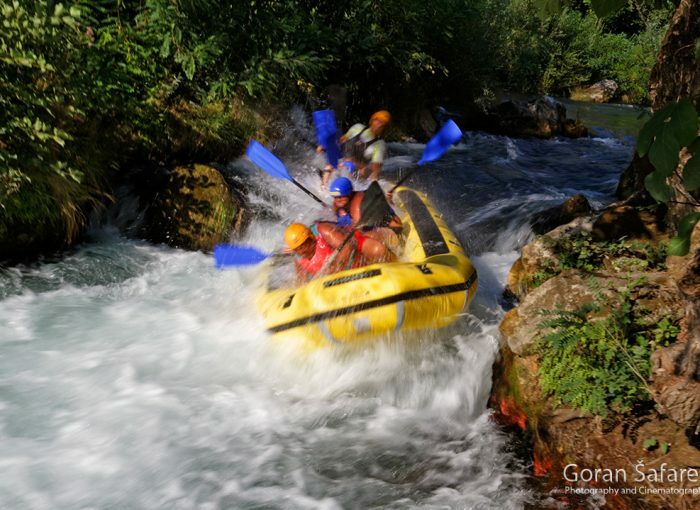 The best rafting is from village Hrvatsko (Osilnica in Slovenia) to Brod na Kupi. The best season is spring when the snow melts from the wild and lush mountains of Gorski kotar, the region with the highest precipitation in Croatia. 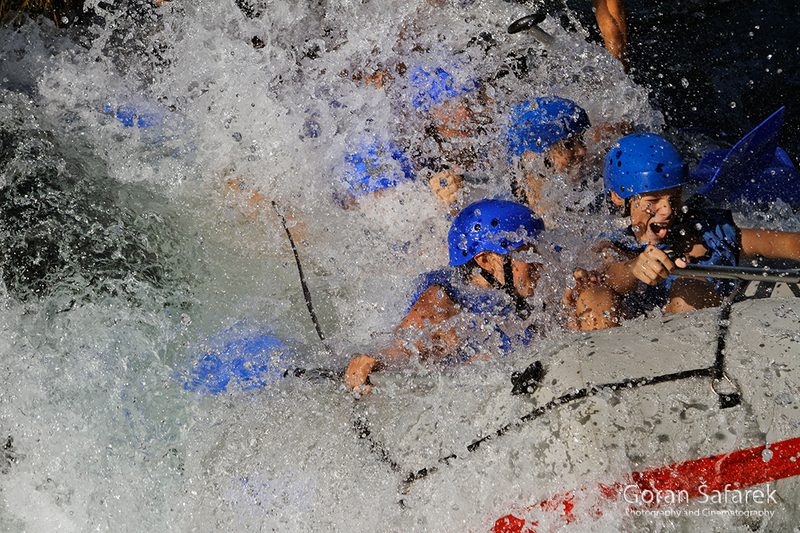 The rafting takes 2-4 hours, depending on the water, usually in April – May, and September – October. A minimal number of the people is 4, and the transfer is included. The Kupa is also an excellent river for private canoe and kayak tours. It will take you several days (depending on the stretch), and there are plenty of the spaces on the banks for overnight camping. You will need police permit though, from border police station in Brod na Kupi. There are smaller waterfalls (old artificial ones, made the needs of the traditional watermills). There are also official camping sites on the Slovenian side. The Zrmanja is the very wild river, with 6 impressive canyons and an estuary that looks like from the moon (the only problem with a moon comparison is only there are a running water :). It flows around mighty Velebit mountain, on the way to the sea. It is relatively short, km, but full of striking scenes. The most magnificent one is from Kaštel Žegarski village to the beautiful excursion place and camp in Muškovci. The Zrmanja in this stretch has cut a giant canyon and is full of tufa waterfalls and rapids. Here it receives short, but equally, if not even wilder tributary the Krupa River, only 7km full of wonders. Not only two rivers join, but two canyons! Just as it’s the case with the Kupa River, rafting is possible in the spring and maybe autumn (if enough rain falls), with II level rapids ant the summertime offers only canoeing, as the water level is lower with the grading of I and II level rapids. This 14km section is the best for white-water rafting and canoeing. Zrmanja is part of the Nature Park Velebit, so solo canoeing is forbidden. The agencies are the only way and the padding takes several hours. The start is in the aforementioned Kaštel Žegarski. After the first hour of paddling down easy rapids, if time and weather permit, guides wil show you beautiful Krupa waterfalls and swim close to them. Downstream lays Veliki buk, the biggest waterfall on Zrmanja. You can only admire it; it is too high to go through it. After Veliki buk, waterfalls and rapids are more common and offer a truly adrenaline pumping experience as you continue down Zrmanja towards Muskovci village where the trip ends. You don’t need previous rafting experience, even children from 6 years of age, accompanied by parents, can participate in this great rafting or canoeing. The price is around 40$ (300kn) per person, and the children discount is 50%. The tour starts usually at 10:00 and ends around 16:00, with the lunch break. 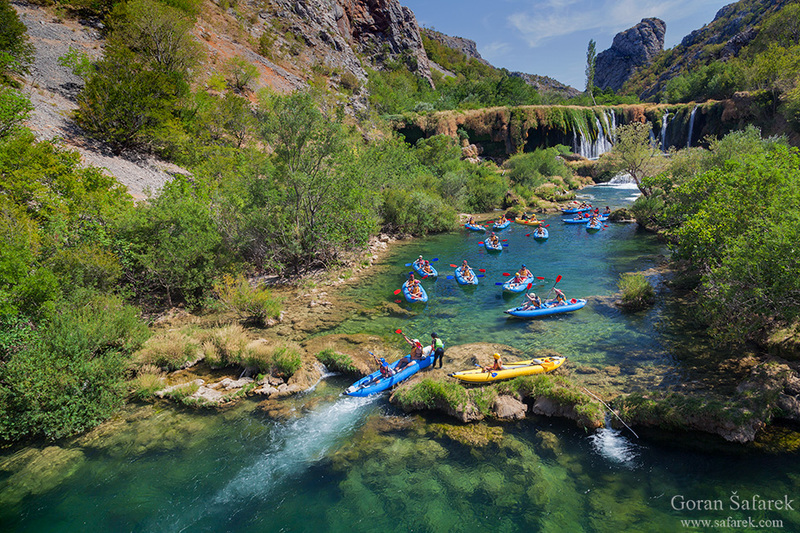 The Cetina is probably the most famous river for rafting and canoeing in Croatia, thanks to the proximity to the Adriatic coast. Big tourist centers of Makarska, Omiš, and Split are nearby and one-day refreshment and adventure are always welcome. Cetina is the longest Dalmatian river, that springs on highlands near Knin, forming the fertile karst valley (polje). It was always the granary of Dalmatia, recently also the energy source from several dams. Lower stretch is wilder and still untamed, hidden in the deep canyon. Gubavica waterfall is highest on Cetina, and river here bends toward Omiš. Rapids and waterfalls are common, in a beautiful environment. Rafting in the protected area of the river canyon attracts many tourists every summer. The quiet parts of the river and the second and third-grade rapids enable a three-hour combination of adventure and relaxation in the amazing Cetina river canyon. Half-day Split rafting tours is the perfect mix of spectacular scenery with just enough whitewater splashing to add a small dose of adventure. Thanks to the steady influx of the water from upper highlands, rafting is possible in the summer too. 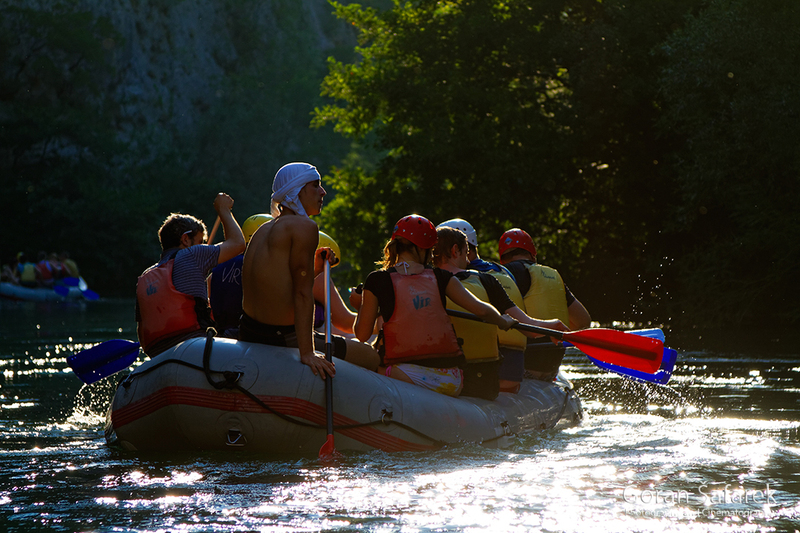 There are two rafting and canoeing sections on the Cetina. One is upstream of Gubavica waterfall: from and Čikotina lađa to Blato na Cetini. The whitewater grade is 2, elements of grade 3. The other, more popular is downstream of Gubavica to Omiš. 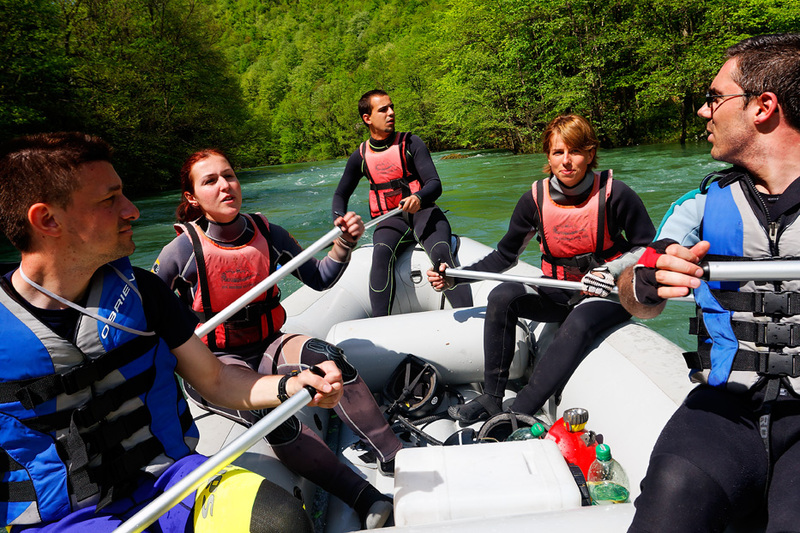 This 12-kilometer-long rafting route stretches from the village of Penšići to the excursion site and restaurant of Radmanove Mlinice / Radman Mills. The route difficulty is II to III. The price for an adult is 200-300kn. 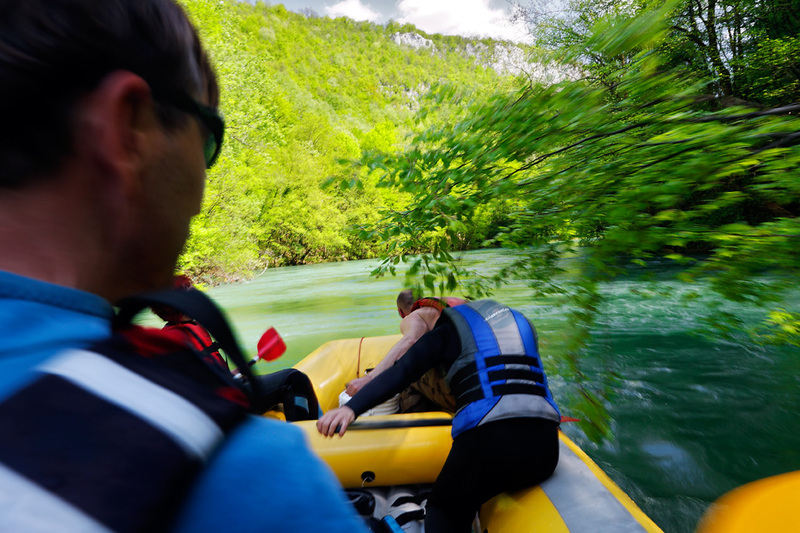 There are a number of agencies that will take you on the river, from either Split, Omiš or Makarska and each one has different starting points, also depending on the rafting section. 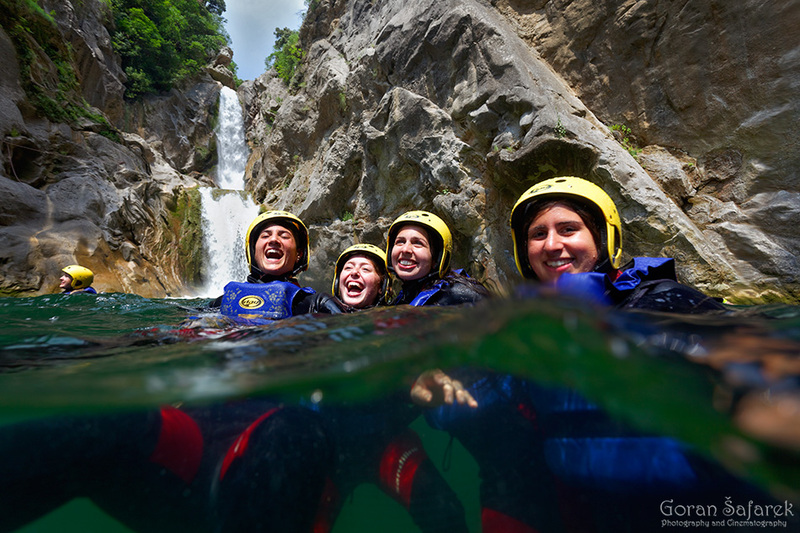 Canyoning on the Cetina River is also very popular. The Una River is a border between Bosnia and Herzegovina and Croatia. For a smaller, but still significant part of the course, The Una flows entirely in Bosnia, around the town of Bihać. It is a very strong river, with a big difference in altitude. It springs in Croatia, in a beautiful lake spring, more than 200m deep. It flows as a small stream in a flat karts valley (polje). It soon receives Krka tributary and enters the giant canyon. From here it forms a border. In Martin Brod Una receives the Unac tributary through spectacular waterfalls. Other equally magnificent waterfalls are Štrbački buk, and more downstream Dvoslap and Troslap and numerous smaller ones. Una in Bosnia is protected as a national park. In Bihać region, Una floes on a flat terrain, but downstream again form a huge canyon. Near Croatian settlement Dvor na Uni, Una again is a border river, until it flows in the Sava near Jasenovac. 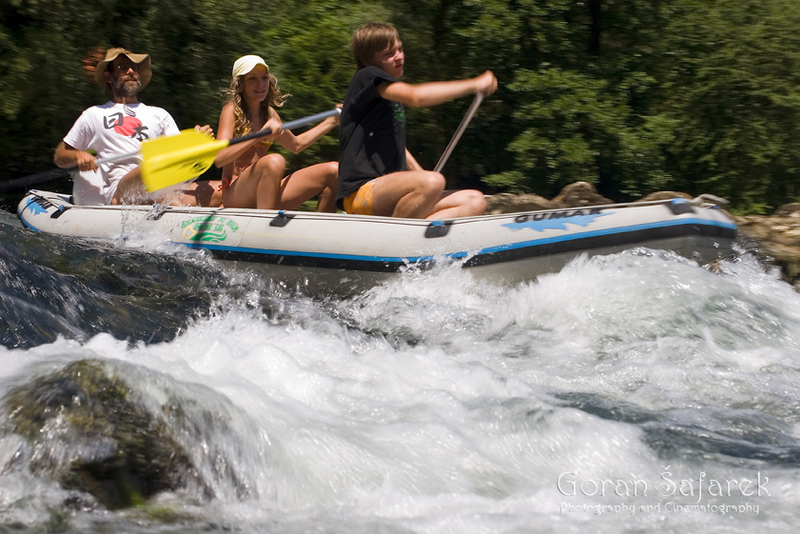 There are two the most popular rafting stages: Štrbački buk – Lohovo and Kostela – Grmuša. The downstream route from 20-meter-long Štrbački buk offers rafters unparalleled excitement and beauty which cannot be found in the rest of Europe! During a high water level period in April and May, the river reaches difficulty level 5. The first part of the route is long, powerful, unpredictable, and full of rapids with numerous waves and whirls. During a medium water level period, the river difficulty level is 3 and 4. The route is complex and strong, with rocks, currents and meanders, and possible surprises. The lower Una River course from Kostela to Grmuša is calmer and more suitable for less experienced rafters. It is an ideal preparation for a more challenging part form Štrbački buk to Lohovo. The water difficulty in early spring during high water levels is 2 and 3. 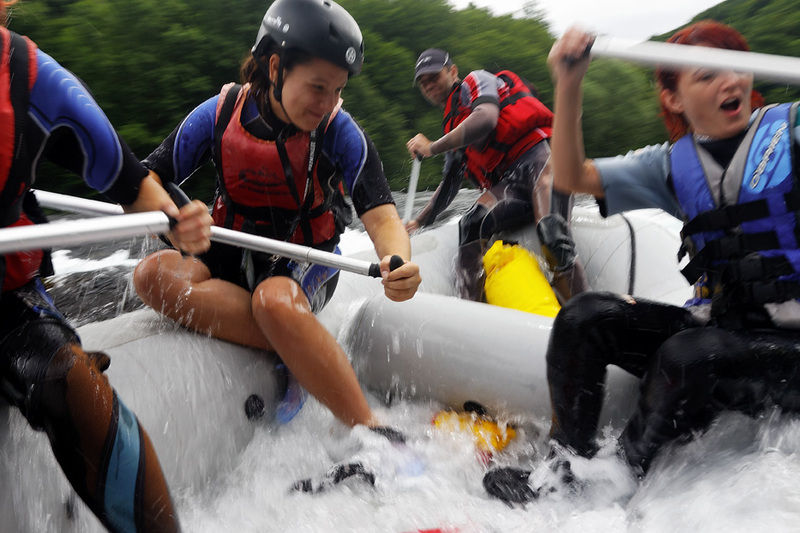 Longer rapids and currents in meanders result in demanding ride which represents a true challenge for inexperienced rafters. During a low water level period, it is suitable for kayak and canoe. Traditional Una regatta that takes place in the summer is much longer than these two stretches. Actually, depending on the year, it covers the entire Bosnian course of the river. The Mrežnica River is one of the four rivers that meet in Karlovac. It springs near Slunj and flows through kast terrain until it joins Korana River. Flowing in its green canyon and dammed by the natural waterfalls, it is perfect for swimming, paddling, and relaxing in nature. Most of its course, the Mrežnica is hidden in a canyon. The upper stretch is hardly accessible, as it is part of the military space. Even downstream, there are few roads, and the canyon is narrow, the river fast and with high waterfall. Most of the rafting and canoeing starts from the bridge near Primišlje. The river is also wider, and waterfalls are more gentle. This is the most beautiful part, that goes until downstream of Generalski Stol. First hamlets appear here on the top of the canyon, so not disturbing much the river. Weekend houses appear too, beautifully nestled in the environment. More downstream, in Zvečaj villages, the river is much more inhabited but still keeps its charm. The best time for rafting and canoeing is in the spring, but unlike other rivers, it has plenty of water in the summer too. Both routes take you across small waterfalls that can be easily passed on a raft, and without any rafting knowledge. Are should be exercised as even the smallest waterfalls could be tricky and fill your bot with the water. The only waterfall that cannot be passed with a raft, but it requires a short walk, is an 8-meter high Waterfall. The water is crystal clear, clean and has wonderful shades of green. You’ll be able to see many birds, wonderful forest, old mills, and pass by a string of freshwater springs. Mrežnica is a rather long river, usually, there are two sections for rafting. The upper is wilder, in a narrow canyon with higher waterfalls and it finishes on the bridge near Primišlje village. Rafting/kayaking on this section of the Mrežnica River takes from 2 – 3 hours and has elements of Canyoning (natural waterslides, showering under waterfalls, jumping from high cliffs, walking through the canyon). Waterfalls can we pass somewhere with natural waterslide, somewhere with jumping into the lower pool or walking around the cascade but some barriers we can cross in kayaks. The water difficulty in early spring during high water levels is 2 and 3. The lower section is in the wider canyon, with the longer quiet part. This river section consists of cascade waterfalls not higher than 3 m. This section is good for peacefully family paddling tour with swimming, showering under the waterfalls and have fun.